This baking obsession has become a bit much. These past months I’ve churned out a succession of sugary confections (which I’ve also shamefully consumed). I’m placing limitations on my baking habit – henceforth, for every cake, cookie or pastry that enters my oven, I will conversely prepare one savory dish. Does a re-hashed Lagasse recipe count? Preheat the oven to 350 degrees F. Using 1 tablespoon of butter, grease a 10×12 or smaller baking dish and set aside. Make Bread Crumbs: In a small bowl combine the bread crumbs, Urfa chili and a small handful of grated parmesan and toss to combine. Make Béchamel: Melt 4 tablespoons of butter over medium low heat. Add the flour and whisk to combine. Cook, stirring constantly, for 3 minutes to remove flour taste. Increase the heat to medium-high and whisk in the half and half slowly. Cook until thickened, about 4-5 minutes, stirring frequently. Remove from the heat, season with the salt, pepper, hot sauce and the remaining grated parmesan. Stir until cheese is melted and sauce is smooth. Cover and set aside. Cook Ham: Sauté ham until slightly brown around edges. Set aside. Make Pasta: Cook pasta in salted water about 5-6 minutes until very al dente (undercooked). Drain in a colander. Melt 2 tablespoons of butter to the pasta pot, add garlic and sauté until fragrant and just beginning to turn golden. Add pasta and béchamel sauce and stir until combined. Set aside. Place one-half of the macaroni in the bottom of the prepared baking dish. Top with one-half of ham and cover with one-half the mixed cheeses. Top with the final half of the macaroni and remaining ham and cover with remaining cheese. 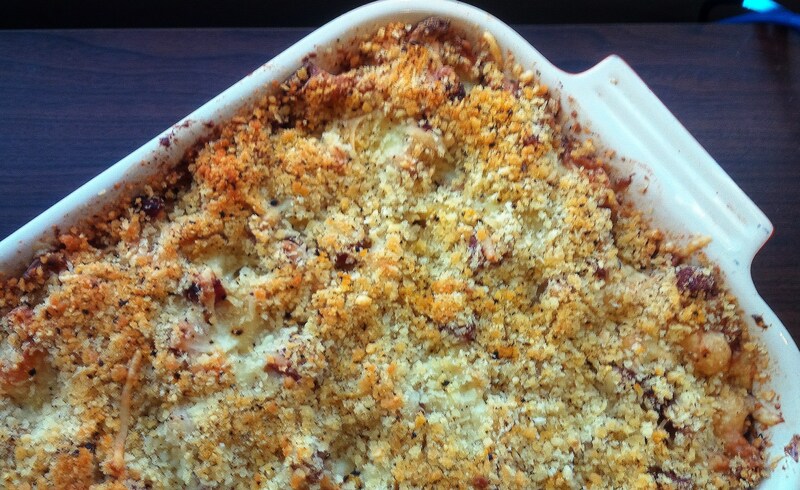 Sprinkle breadcrumbs over the top of the macaroni and cheese (can be made 1 day ahead. Cover and chill. Add 10-15 minutes to final cooking time). Bake for 40 to 45 minutes, or until the macaroni and cheese is bubbly and hot and the top is golden brown. Remove from the oven and allow to sit for 5 minutes before serving. This entry was posted in Recipe and tagged cooking, Culinary School, food, food nerd, Foodie, macaroni and cheese, Recipe, Recipe by Julie "Phoren" Seyler. Bookmark the permalink. This actually sounds pretty good. I’ll skip the chili and whatever Tapatio is, though.